With the results sure to affect politics as well as pocketbooks, health insurers are already preparing to raise rates next year for plans issued under the Affordable Care Act. But their calculation about how much depends on their ability to predict how newly enrolled customers – for whom little is known regarding health status and medical needs — will affect 2015 costs. At stake are price increases that buyers on the federal exchange, healthcare.gov, and other online marketplaces will encounter when they get renewal notices later this year. Forecasting success or failure could also affect whether insurers stay on the exchanges, a key pillar of the health overhaul. The official 2014 enrollment period closed at the end of March for most consumers. But carriers selling medical plans on healthcare.gov must file initial 2015 rate requests with federal regulators in late May or June — even though they have little idea about the health and potential costs of their newly enrolled members. Deadlines also loom for state-run exchange filings. WellPoint, the biggest player in the online exchanges, is already talking about double-digit rate hikes for 2015. Such increases would give ammunition to Republican critics of Obamacare before the November elections. The health law required insurers to accept all applicants this year for the first time without asking about existing illness. That reduces what they know about customers and raises chances they’ll sign sicker, more expensive members who were previously denied coverage. At CoOportunity Health, a nonprofit carrier in Iowa and Nebraska, many enrollees scheduled medical treatments — including surgeries — as soon as possible after their new coverage began Jan. 1, said Cliff Gold, its chief operating officer. Among the procedures were several expensive transplant operations including heart-lung procedures that can cost over $1 million each. Just as the first enrollees were more probably likely to need immediate care, insurers believe people who pushed the deadline may be healthier and younger. If so, they would balance the risk and help cover the cost of the early birds. Blue Shield of California signed more than 50,000 people the last two weeks in March. “It is an actuarial nightmare to try to guess what you’re going to get,” said Gold. It’s not just member health that insurers have to think about. President Barack Obama allowed many people to keep old plans that aren’t compliant with ACA rules. Carriers must calculate how that exception (people covered under old plans are thought to be healthier on average) affects average costs in their new policies. What economists call the cost trend — how high prices rise per procedure and how many procedures Americans get this year — may be the single biggest variable in setting prices for 2015, experts said. And the trend seems to be up. After several years of relatively tame increases that many tie to a sluggish economy, analysts saw medical spending accelerate late last year. Even so, the forces affecting 2015 premiums may not drive up Obamacare prices as much as some are forecasting. Finding that insurers have gotten discounts from select hospitals and doctors, the Congressional Budget Office recently lowered its estimate for the cost of premiums and taxpayer subsidies under the health law. “I’m not expecting double digits like some people have predicted” for 2015 rate increases, said Axene. “I’m expecting mid-to-high single digits” — somewhere from 6 percent to 8.5 percent. Given the uncertainties that come with a major new social law, Independence Blue Cross believes the picture won’t become fully clear until much later. As an insurance broker I can assure everyone that the rates will go up at a minimum by 25% and that will be the lucky ones. More disturbing are the slashes about to occur to Medicare Supps and Medicare Advantage, disallowing health health services. This will make the purchase of Long Term Care insurance almost a mandatory product in order to ensure that the aging population will be able to get services at home. Everyone who suffers under this Leviathan monstrosity can thank a flaccid “Republican” party, and their SCOTUS champion conservative appointee, John Roberts , for it even being an issue. There is a fellow that works with me and his wife enrolled in Obamacare when she was required to. She just in the last few weeks has been diagnosed with Cancer, now no Doctor will even schedule an appointment for her. None of the major Cancer Centers will talk to them and Doctors are shunning them. I suppose she would have been better off with no Insurance than this. 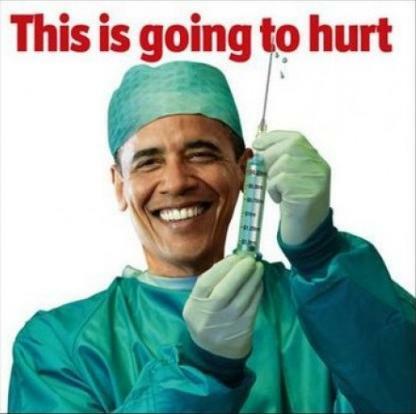 With no Insurance even one of the major Cancer Centers might take her on as a charity case, but with Obamacare no one even wants to talk to them….get ready for the Euthanization of anyone over 50, this will solve the lack of funds in Social Security. In a way, Rick, there could be some silver lining here. Folks might wake up to the fact that they are individually responsible for their health. They might begin to eliminate poisoned fluoridated water from their consumption. They might begin to eliminate GMO FrankenFoods from their diets, along with known carcinogenns like artificial sweeteners, and pass on HFCS and any number of other artificial ingredients. They might skip the fast foods which are swill unfit for pigs. We are overfed and undernurished as a nation. We eat 2x the calories and amounts of food we need. They might demand GMO mandatory labeling from their state governments. They might decide to get off their ( usually ample) backsides and get some exercise and even a little cardio. They might find out their best “doctor” is staring at them in the mirror. They might find out that the general attitude of the big pharma-big medicine cartel is to “treat”, not HEAL. They might get off any dozens of prescription chemical cocktails with dangerous side effects. Not everyone is blessed with good enough genetics to totally free themselves from the clutches of the pharma-med cartel. But most of us could considerably improve our quality of life by OUR OWN CHOICES of consumption and fitness. I take no prescriptions. I do not have a doctor. I have never been to a doctor in my life for a “condition”, only injuries or a pre-employment physical etc. And the last time anyone stuck a dangerous vaccine of any kind in my arm when a Navy Corpsman glared at young Marine recruits, many decades ago, welcoming them to a sadistic torture chamber of chemical cocktails. No flu shots or vaccinations of any kind, ever since, or ever again. I see the possibility that a few will take charge of their health instead of counting on ” .Gov ” to do it for them. Just not enough, and as you know, we have to opposition party to defund this Orwellian nightmare.